During the spring time, robin redbreasts are a common sight as they care for their nests, eggs, and fledglings. Robin fledglings sometimes end up on the ground as they attempt to learn to fly. If you come across a baby robin, determine that the baby bird has been orphaned or injured before taking any action to capture and care for it. Provide basic care for a fledgling after rescuing it, but contact your local wild bird care center as soon as possible to turn the bird over to qualified professionals. Determine the baby robin redbreast needs help. Both male and female robins take part in the care of their young, so if you find a baby bird on the ground it is likely just learning to fly and and its parents are nearby. Watch from a safe distance for 30 minutes to see if the parents return. If not, or if the baby bird shows signs of injury, you may need to take action. Capture the baby bird either with your hands or by tossing a very lightweight towel over it. This may not be necessary and can injure the bird so do this only if you feel it is an important safety issue. Once the bird is immobilized, hold it with its wings flat against its body and lift it carefully up from the ground. Place the baby bird in a cardboard box lined with a soft towel underneath; cover. Punch holes in the sides of the box to allow for air circulation and keep the lid on the box except for feeding times. Darkness calms birds, so the baby robin will be less likely to injure itself fluttering around in this contained space. Keep the baby bird warm by placing a hot water bottle under the towel or by filling two plastic water bottles with warm water and placing them under the towel on either side of the bird. Do not place the cardboard box in the sun or in front of a heater; too much direct heat can cause overheating and dehydration. Call your local bird or wild animal care shelter to let them know you have rescued a baby bird. Ask the shelter whether they will be able to pick up the animal or if you need to deliver it. Makes the necessary plans for the transfer of the bird; the sooner the better. Feed the robin often until it can be transferred to the shelter. Fledgling robins need to be fed every hour; featherless babies, every half hour. Unlike some birds, robins eat worms and insects rather than seeds. Offer bits of canned cat or dog food, preferably one with high protein, to the robin via a toothpick, rounded chopstick or tweezer and follow each bite of food with a few drops of water off the end of your finger. Note baby birds do not require a lot of water. If you have dry cat or dog kibble, try soaking it in warm water and offering it to the baby bird with a tweezer, being careful not to injure the bird. The water in the kibble should suffice for the fledgling's hydration needs. According to the Wild Bird Care Centre of Ontario, and contrary to popular myth, a robin will not abandon her young if she smells the scent of a human on them. 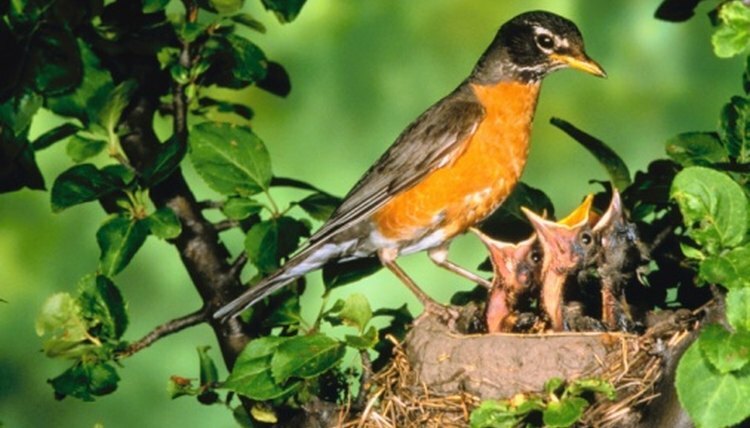 In other words, if you find a baby robin you may handle it for as long as it takes to return it to the nest; but be quick so the mother can continue feeding her ravenous offspring. If you are unsure whether the baby is indeed abandoned, place the baby in a basket and place the basket on a high branch of a nearby tree and then keep an eye out for the parents. Only when you are certain the parents are not coming back should you take action. Use caution when feeding the baby robin and do not hold the bird when giving it food or water. When offering water to the baby bird, do not squirt the water directly down the bird's throat or allow it to get into the bird's nostrils, which can force fluid into the lungs and cause pneumonia.